It's not often that we're invited to a Jewish African-American wedding, but we're inviting you to experience the fun and joy of Avner and Shonta's wedding in this video. We don't know any details about the couple's Jewish affiliation, only that they wanted to have a Jewish wedding, and that they were lucky to have Modi Rosenfeld, one of our favorite Jewish comedians, available to serve as cantor. We've profiled Modi before as a stand-up comic and in the role of a Chasidic wanna-be Hollywood playwright. 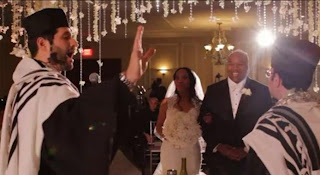 Modi and his colleague Brian, an insurance salesman who serves as the rabbi at this wedding, pull out all the stops in giving this couple what they asked for, and more. Somehow they manage to include elements of Chanukah, Pesach, Sukkot, Rosh Hashana, and Yom Kippur. We think this wedding is a good way to start the weekend. Shabbat shalom and we'll see you again on Sunday. Enjoy! Noah's Ark Surfaces in...The Netherlands ?? ?